This book offers new insights into the understanding of organized crime based on the enterprise paradigm and the theory of profit-driven crimes. It will be a source of debate and inspiration for those in law enforcement and academia in this area. It makes a contribution to intelligence-led and knowledge-based policing, an emerging area of interest that builds upon and enhances policing as knowledge work, police officers as knowledge workers, and police forces as knowledge organizations. This book offers to practitioners and academics alike a new thinking on understanding the business operation of organized crime, to better to be able to detect and disrupt organized criminal enterprises. Police all over the world are struggling with the combat against criminal organizations with varying success. The core idea behind this book implementing intelligence strategy for policing criminal business enterprises should certainly be appealing. Knowledge management is important and often critical in policing. Combating fraud and financial crime is an interesting example, where financial intelligence and interaction between public and private sectors are required. Petter Gottschalk is a Professor of knowledge management in the Department of Leadership and Organization, Norwegian School of Management. 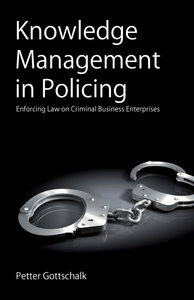 He teaches knowledge management in the Norwegian Police University College to police executives in management programs. He has published original research on police management, organized crime, and police investigations in leading academic journals. His education includes an MBA degree from Germany, an M.S. degree from the USA, and a D.B.A. degree from the UK. He has been a business executive in several global companies including ABB.